Even shaman took a massive hit, might affect Thing From Below. Kind of lame but Even Shaman was very powerful in wild. Probably had to thanks to Genn being a thing (and Blizz being not willing to nerf neither him nor Baku). This is ridiculous. Even Shaman was the only good Shaman deck in standard. It cannot recover from this. It needs the ability to buff its totems. So Shaman is dead until April in standard. Shamy i really not that strong am. I really think this nerf could have waited until the rotation. 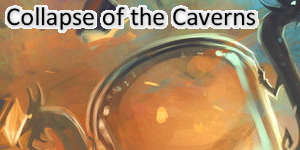 Shaman's core set is already super bad, this nerf makes it even worse. Stinks for the current state of Shaman right now, but this is a long overdue nerf. Flametongue has low-key been on of the best cards in the game since it's release. This is what it always should have been. That, or a 2-mana 0/2. I would say this nerf wasn't super necessary, but it's ok. Sorry, but you are TOTALLY WRONG! Wild even Shaman is OP because of Flametongue-totem. Having your totem gain +2 attack is huge, and far more important than the fricking 4 mana 7/7; that when you would read the numbers on hsreplay, you would see that the winrate of this card is actually quite low in even shaman. No, this card is not really important in this deck. 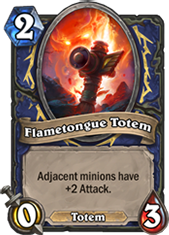 I said it before: Even Shaman in Wild needed only one nerf, and that's Flametongue-Totem. This card allows your Totem Golem to hit for 5 damage, allowing it to destroy absolute everything up to 3 mana and most minions at 4 mana too. With 4 health it even often survived and allowing it to trade again. No longer being able to kill a Tar Creeper and having still a 5/1 minion (that probably also get healed through healing totem) is FAR FAR more important than a 4 mana 7/7. This nerf will affect Even Shaman heavily and i doubt that it's still king of the hill anymore. 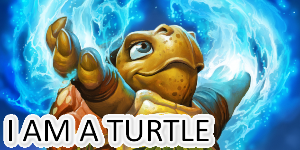 Especially Zoo and Aggro-decks can now easily deal with Even Shaman; since they lack AoE and no longer be able to kill anything with their totems. The totem deserved to cost 3 mana, but I doubt this will even tickle Even Shaman in Wild. Start of Year: Provoke the failure of 3 expansions, force nerfs on otherwise balanced cards, bring deckbuilding to an all-time low and get rotated one year earlier for being such a threat to the game's health. Still pretty good at 3. But Shaman basically has no good decks now (this obviously kills Even Shaman), which is sad. 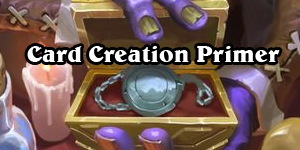 More importantly this finally opens up design space for shaman 1-drops. I love how they still won't touch Barnes, but somehow Flametongue Totem is the problem? They're obviously targeting even shaman in wild, but Big Priest still has the highest played population on wild. Cheating out 8-10 mana minions on turn 4 or 3 with a coin is still ok though. Mulligan win rate when Barnes in hand is 80.3%, but let's nerf Flametongue Totem. This nerf is harsh for shamans and it hurts me a lot since it is my fav class to play. In standard they killed shudderwock and only even shaman was a thing.. now this, goodbye shaman for standard players. I can see why they did this nerf tho.. in wild the deck was absolutely nuts but it felt so good to destroy those horrible big priest players. while I do agree whole heartily that these two cards deserve a nerf more than anything else, I dont know how they would do it without revamping the cards, which blizzard has not really been open to. but if they dont get nerfed than that would just be disaster and chaos forever. and the longer we wait for the nerf to come, the more cards get nerfed because of them. only good shaman deck in standard OR wild. shammy deserved better than this.